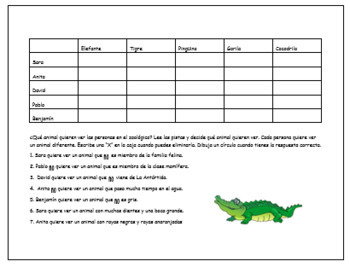 This is a set of 3 Spanish logic puzzles. 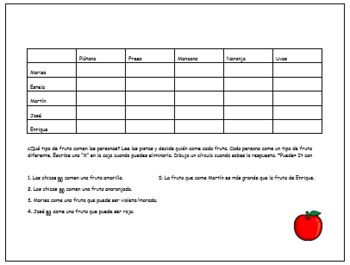 These are simple, level one Spanish puzzles. Students read clues and gradually eliminate options until they solve the puzzles. These are fun bell-ringers, sub plans, quick challenges and are brain-friendly. The themes of the puzzles are fruits, clothing, and zoo animals. All puzzles have answer keys and are fully editable. Students will ask for more!